Sure, you can serve your Halloween party beverages in a big old bucket of ice, or in an empty wheelbarrow, or even a kiddie pool out back. 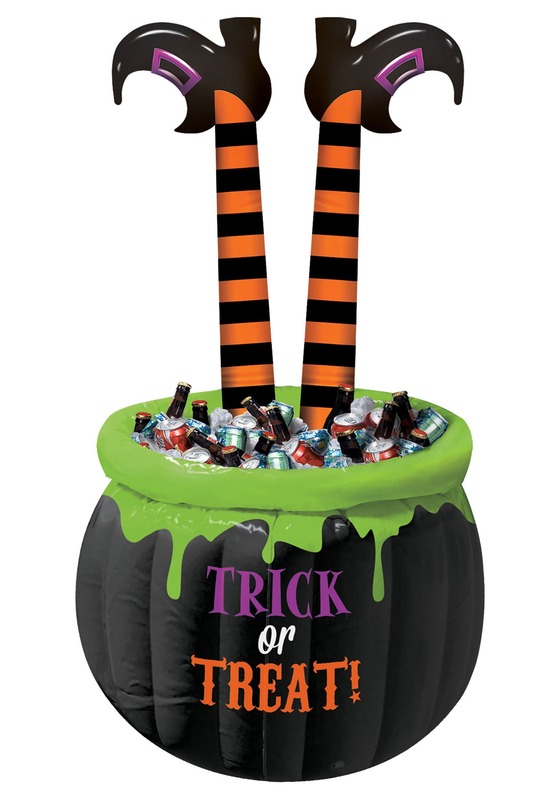 But...having seen this Inflatable Witch Legs Cooler, we have to ask you: Why would you want to? Kick your party up a notch with this hilarious decor item that is both functional and festive! When it comes to throwing a successful Halloween bash, the real impact is in the details. A cooler like this can make your party...well...a whole lot cooler to chill at! This clever cauldron inflates to over four feet tall! Talk about bewitching. It says "Trick or Treat" on the outside, and appears to be bubbling over with green, slimy potion—that normally may not be appealing to party guests, but on Halloween, it's a huge selling point. This pot has a huge capacity, which means fewer refills all night long. And, oh yea...there may or may not be a witch who's seen better days inside. But just ignore her and have fun! This cauldron cooler will have your guests hanging out into the wee hours of the night, just waiting to go grab another cold one. Yours will be the most talked about party this Halloween, just, make sure there's plenty of coffee on hand for the morning after! We can see one witch who can definitely use some.